^ Daniel, Taylor (2013-05-16). 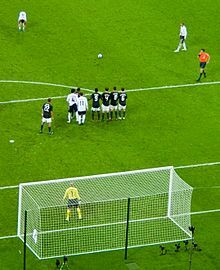 "David Beckham exits as gracefully as one of his arcing crosses". The Guardian. Retrieved 18 December 2014. ^ Bodinger, Katie (2008-07-28). "Why Ryan Giggs is more scared of his mum than Fergie". WalesOnline. Archived from the original on 13 October 2012. Retrieved 10 June 2012. ^ Talbot, Simon (2007-02-21). "Beckham shines to give Real a slight advantage". The Guardian. Retrieved 12 September 2014. ^ Brassell, Andy (2013-05-12). 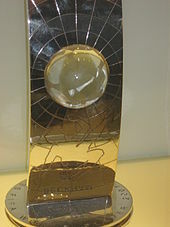 "David Beckham's Paris St-Germain clinch French title". BBC Sport. Retrieved 12 September 2014. 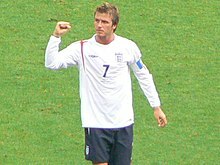 ^ "Team GB: David Beckham left out for football reasons – Stuart Pearce". BBC Sport. 2012-07-02. Retrieved 12 September 2014. ^ Barclay, Patrick (2000-12-30). "Ferguson happy as Beckham takes a great leap forward". The Telegraph. Retrieved 18 December 2014. 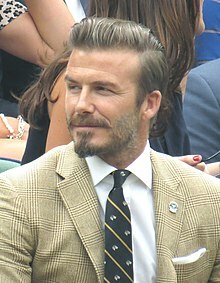 ^ "America – meet David Beckham". Marksimpson.com. 2007-07-13. Retrieved 13 November 2008. ^ Grant, Katie; Papasian, John (2 July 2015). Duff, Oliver, ed. "Premium cover". The i (1435). p. 2. 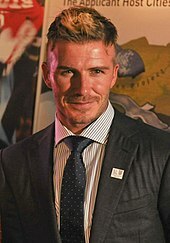 ^ "Why David Beckham backing Remain could spark a constitutional crisis". The Independent. Retrieved 2018-11-27. 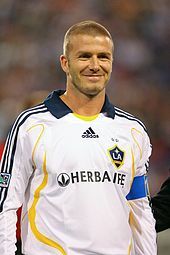 ^ "David Beckham: LA Galaxy unveil statue before MLS season opener". 2019-03-03. Retrieved 2019-03-05. 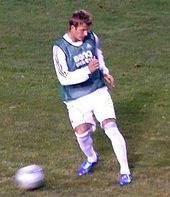 ^ "David Beckham". Independent.co.uk. Independent. 2013-06-14.